Google Places is an extension of Google Maps and features user reviews about just about any location you can think of. If you’re building a site for a business that is listed on Google Places, you might want to show off their reviews. Google Places Reviews lets you do that with just a few steps. Google Places Reviews adds a widget and shortcode to your WordPress install that allows you to pull in reviews and list them on your site automatically. All you have to do is enter the location of your business, and reviews will be pulled in and displayed in one of several themes. New reviews will be pulled in whenever they are posted so that your site remains up to date without you having to manually update it. You also have control over exactly what kind of reviews are shown, for instance only reviews above a five-star rating, and the number of reviews. It’s simple to use and can be added to sidebars with a widget or posts and pages with a shortcode. After you install and activate the plugin, the first thing you have to do is set up an application at Google with the Google Places API set up. This can be done using the Google API Console. When you log in, create a new project, then navigate to the “API’s” section. From there, make sure you’ve switched the “Places API” to “on” and then go to “API Credentials” to copy your API key. Then, you can visit Settings -> Google Places and paste this key into the text field on the main options page. This will connect your WordPress site to Google Places. There is also an “Advanced Options” tab which lets you switch off the external CSS for the plugin if you want to style the places widget yourself. There are two ways to actually add reviews to your site. The first is by going to Appearance -> Widgets and drag the “Google Places” widget into any sidebar. You can give the Widget a title, then find the location you want to pull reviews for by using the “Location Lookup” text field. Just start typing the name of the business or the address of a business’ location and select the proper one from the drop-down. The plugin will automatically fill in the “Location Reference ID” (a long and unreadable string) for you. From there, all you have to do is customize the widget. The first section is “Review Options” which allows you to specify how many reviews to show at a time (up to 5), and the minimum rating reviews should have, meaning you can limit them to something like 3 stars and up. 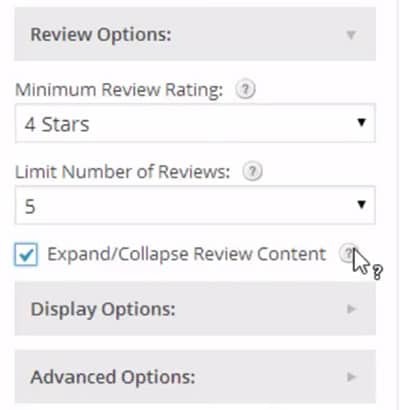 You can also choose to “Expand/collapse Review Content”. Some reviews may be very long, and Google Places Reviews can intelligently trim this down so that only a short excerpt from a review is shown. The next section is “Display Options,” where you can choose a theme. There are three themes to chose from, which can be seen in the plugin’s documentation. Themes have a light and dark version so you can match the look of your site. “Display Options” also lets you have fine-grained control over what exactly is shown in each review, such as whether or not to include the rating text, Google’s image, and Business Information. In “Advanced Options” you can select from a few more options, such as how often to pull in new reviews, whether or not to hide the title, and whether links should be nofollow and open in a new page. Most of these can be left at their defaults. After this is set up, you’ll see your new list of reviews appear in your sidebar, updated frequently with new reviews. You can also use a shortcode to add to this list. The shortcode has the same parameters as your widget, but can be added to posts and pages. 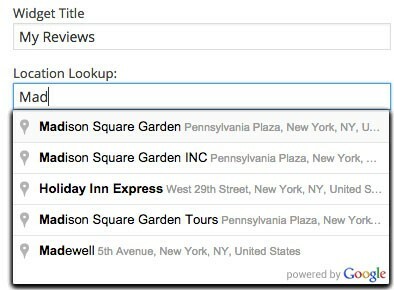 In the WordPress post editor, simply add in the google-places-reviews shortcode. The only required field is the location ID. Since there’s not really a simple way to find this, the best way to get your location ID is to actually add a widget and use the “Location Lookup” from the last step to get it, then copy and paste it into your shortcode. There is a full list of parameters that you can take advantage of listed in the plugin’s documentation, but you can customize just about any part of its output. This will output your list of reviews, either as a block element or aligned to the left and right, depending on how you style it and works pretty much the same as how your widget works. And just like that, you can use the Google Places API to your advantage to highlight the best reviews for all your users. Google Places Reviews has gone through several iterations and is a solid and well-maintained plugin. There is a free version with a few small features (no filtering of reviews, collapsing of long reviews or priority support), in addition to the pro version. It also has some pretty great documentation if you are looking for help. Or, you can visit the support forums if you have a specific question.